Now I can't trace where the recipe comes from, but the taste really impressed me then. Recently I found it in my old files and immediately felt like making it again. It's a thick sweet-sour-spicy custard which doesn't resemble anything else. Making it isn't much effort, just requires some patience as the custard needs to be slowly heated with constant stirring. Heat the cream in a middle size pan. Add the sugar, vanilla sugar, lemon juice, honey and flour and mix well. Gently heat the mixture stirring constantly and not letting it boil. Add the milk, egg yolks, rum, cinnamon and stir well. 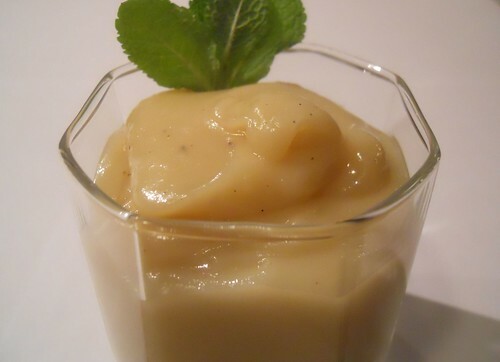 Continue cooking the custard on very low heat stirring constantly till it thickens and gets glossy. Pour into 4 small serving cups and let cool a bit. Serve warm, decorated with mint and fresh fruits of your choice (kiwis, strawberries and blueberries do really well).